Among the several action items on tomorrow night's Elk Grove City Council meeting is a discussion to consider changes to the Norms and Procedures manual. That manual acts as a guide for Council Members for the protocol on things ranging from attendance at official functions to interactions with the public during council meetings. Among several issues highlighted in the report are possible changes to the manual. One area highlighted for deliberations is attendance on legislative advocacy trips. The cornerstone of Elk Grove's legislative advocacy trip has been participation in the annual Cap to Cap trip to Washington D. C. sponsored Sacramento Metropolitan Chamber of Commerce. Although the norms call for the Mayor and Vice Mayor to represent the City on such trips, in recent years Council Members and members of the City's executive management team have also been included in the annual delegation. The staff report notes the City Council does not participate in a separate federal advocacy trip as it has in the past been combined with the Cap to Cap advocacy event. 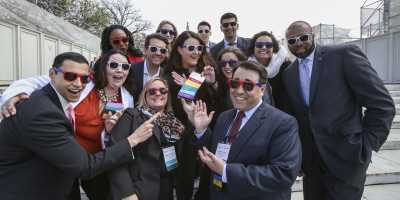 It is noted there are more advocacy trips available for the City and "with a new Federal Administration and Congress, it may be more advantageous for Council members to take a Federal advocacy trip at another time during the year." In addition to more advocacy trips, the report addresses administrative support, representation at ceremonial functions, Procedures for Proclamations, and appointment of elected official vacancies. Although not highlighted in the possible discussion, the current norms and procedures manual notes in the decorum section that "The use of cellular telephones, portable computing devices, and the like are discouraged during council meetings in order to remain attentive to members of the public, staff or others as they are speaking to the Council." At the Most recent meeting on February 8, the City Council was criticized for the appearance of texting with audience members during the appointment of the newest member of the Elk Grove Planning Commission. When addressed during the public comment at the February 8 meeting the council members did not address their use of personal devices during deliberation.